Experience an unforgettable journey through the Blue Mountains past the iconic Three Sisters to the World Heritage listed Jenolan Caves for a guided tour of these unique limestone formations. See the mysterious Blue Lake, and experience a fully guided cave tour through Lucas Cave. 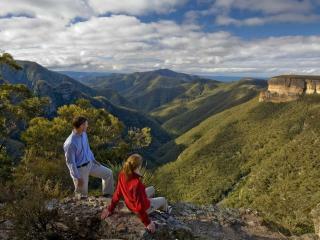 Relax at the Cave House and watch native wildlife in the bush, the deep caves or the great valley. This full day tour departs from Sydney on set days of the week. Experience the best of the Blue Mountains with this luxury Blue Mountains Wildlife Day tour offered by Mount 'N Beach Safaris which takes you on a journey into the World Heritage Region.Take in the stunning landscapes and marvel at towering sandstone escarpments.